A month after guiding New Zealand to the Olympic silver medal in Rio, Sean Horan has stood down from his role as women's sevens coach. Coach Sean Horan is stepping down from his role as Black Ferns Sevens women's coach only a month after leading the world champions to an Olympic silver medal in Rio. Horan has been in the role for nearly five years, since the Go4Gold programme was launched by New Zealand Rugby with the aim of attracting women from all sports in order to build a strong national sevens team. In that time he has enjoyed great success, guiding the team to the first three HSBC World Rugby Women's Sevens Series titles and a second-place finish in 2015-16 behind Australia. New Zealand won 10 series tournaments in those four seasons and went 37 matches unbeaten between April 2014 and May 2015. Horan, who departs just a week after Sir Gordon Tietjens' 22-year reign as men's coach came to an end, also led New Zealand to Rugby World Cup Sevens success in Moscow in 2013. “I’m immensely proud of the team, the players and the management. It’s been a huge privilege to have been part of this amazing ride,” Horan said. “Our vision was always to inspire young women to wear the black jersey and be very proud and I think we did that. The game now is huge. 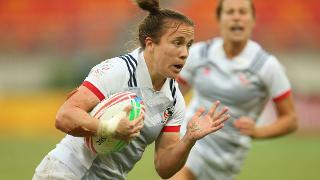 There are many clear pathways for young women to embrace sevens and aspire to wear the black jersey. “It’s hugely satisfying to have been part of this great adventure right from the beginning. We started with a blank canvas and built a great team in a short period of time. I leave knowing my successor will come to the job with a strong high performance programme established. “We owe a huge debt to Sean for his efforts in building a strong national sevens side in a short space of time. The team’s enjoyed a proud record of success under his guidance, including the historic silver medal performance in Rio last month.